Travis and Deanna Mathey pick out a toilet Wednesday near the Milner Landfill that will be used in the Routt County Redneck Olympics on Saturday in Hayden. For descriptions of the events, visit www.rcrednecks.com/events. For descriptions of the events, visit http://www.rcrednecks.com/events. Steamboat Springs — Wendy Lind said someone in Steamboat Springs is busy hunting a squirrel for the Routt County Redneck Olympics grill-off barbecue challenge. Rumor has it someone else has modified his riding lawnmower to reach an impressive speed of 35 miles per hour. “We’re starting to hear all sorts of stories,” said Lind, one of the lead organizers for the inaugural Redneck Olympics. On Saturday, the “Olympic” games at the Routt County Fairgrounds in Hayden will include mud surfing, blind tractor driving and a paintball obstacle course, among others. The revelry coincides with Hayden Daze, a longstanding annual tradition in the West Routt County town. While the Redneck Olympics start Saturday, Hayden Daze kicks off Friday at 6 p.m. at Dry Creek Park with a beer garden and dinner. Street dancing starts at 8 p.m. The celebration resumes Saturday with the Hayden Daze Parade at 9 a.m. in downtown Hayden and continues with live music and other festivities throughout the day. The Redneck Olympics events start at 10:30 a.m. Saturday with the lawnmower triathalon. 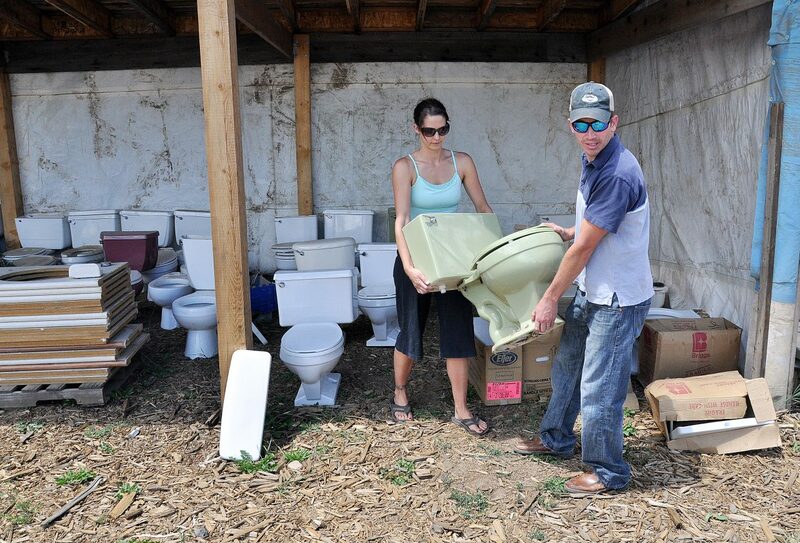 As part of their preparations for the Olympics, Travis Mathey and his wife, Deanna, loaded a used toilet into a truck Wednesday near the Milner Landfill. On Saturday, the toilet will be loaded into a bathtub on skis and towed by a tractor. Lind, who owns Axial Arts Architecture with her husband, Kevin, said anyone interested in participating in the Redneck Olympics can register online at http://www.rcrednecks.com or simply show up at the games Saturday. The games will serve as a fundraiser for the Routt County Agricultural Youth and Heritage Foundation, a nonprofit organization that works to make the fairgrounds affordable and accessible to children.